Yamaha RX-A3010 review | What Hi-Fi? This represents a real return to form for one of home cinema’s oldest and most respected names. The Yamaha A3010 is an elegant receiver, its sleekly restrained fascia punctuated by the bare minimum of logos and buttons. Every control operates with the expensively damped slickness you’d expect of a model in this class, and Yamaha is rightly proud of the rigidity of the ‘H-shaped’ chassis, which features several strategically placed cross-members designed to minimise vibration. Together with a fifth, centrally mounted isolating foot designed further to limit resonance – the rather grandiosely named A.R.T Wedge – the result is a design that feels every bit as upmarket as it looks. It’s formidably equipped, too. 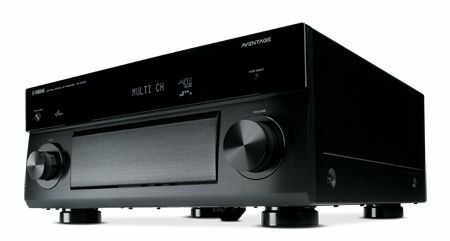 As with most higher-end designs, the RX-A3010 includes nine channels of power amplification and, unlike most earlier Yamaha flirtations with the nine-channel configuration, all channels of output are the same, at a hefty 150W per channel. As with most similarly endowed designs, you can reconfigure the amplification to suit your needs should you want to do without the delights of 9.1, with biamplification or Zone 2 listening also available if you prefer. The video and digital audio circuitry is every bit as impressive. The Yamaha adopts HQV’s high-performance VHD1900 chipset for video upconversion and scaling, and provides a comprehensive array of picture adjustment options. For the less dedicated, a few basic ‘automatic’ modes by and large work sufficiently well to satisfy. That’s backed by 24-bit/192kHz Burr-Brown DACS for every channel, plus eight HDMI inputs and twin outputs, allowing for simultaneous connection to two displays. Once installed and calibrated – an automatic process that’s both reassuringly accurate and impressively rapid – the RX-A3010 swiftly settles into a very impressive stride. Even when cold, it’s clear that this Yamaha is a thrilling listen. It’s exciting, uncannily accurate and blessed with a soundfield so tall, broad and richly textured that the confines of your listening room seem to melt away around you. Engage the Sci-fi DSP mode – one of the 23 available sound modes on offer – and the A3010’s nine-channel prowess is remarkable, its speaker-to-speaker cohesion and energy-infused sound propelling action-packed soundtracks such as Star Trek or Terminator: Salvation to new heights of scale and excitement. Strip back the channels and opt for a sparer sound with the Yamaha’s Pure Direct mode engaged, and the A3010 sounds just as remarkable. It’s fleet of foot, expressive in the lower registers and there’s a meaningful musicality to its rhythms – even Against Me!’s breathless garage rock has all the fire and frenzy it ought. There’s a decent array of network and digital-media-friendly features: you can stream from Napster (but not, as yet, Spotify) plus vTuner’s internet radio hub, and it will support a broad range of music formats, including WAV, MP3, WMA, AAC and FLAC. There’s no provision for wireless access to content though – Yamaha suggests using a Belkin bridge, around £30, should you want to use wi-fi to stream your tunes. Criticisms are few, but worth highlighting. There’s no AirPlay: Yamaha prefers to promote its AirWired technology. It delivers fundamentally the same experience, but requires an optional transmitter/receiver unit, the YID-W10. Yamaha plans to bundle the relevant kit in with any RX-A3010 purchase for a set time. And the Yamaha eschews the very latest surround processing modes sported by some rivals. It omits Dolby Pro-Logic IIz, for example, to say nothing of THX or the new Neo:X system offered by DTS. We don’t see that as a weakness, and nor should you. The rest of the RX-A3010’s offering is far too strong to allow such concerns to distract you.